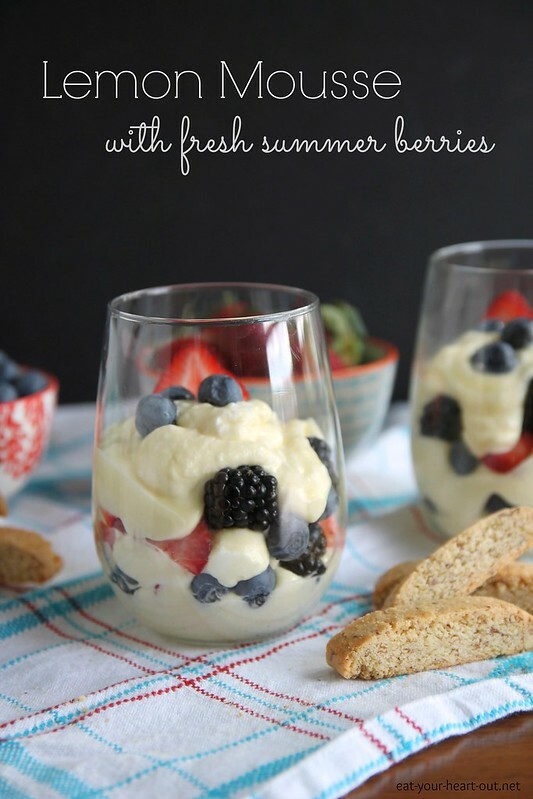 Light and airy lemon mousse layered with fresh mixed berries makes for the perfect no-bake summer dessert. I think the summer heat is getting to me. Earlier this week, we installed one of our window air units in the bedroom (so we can, you know, actually get some sleep without suffocating). It worked brilliantly until I woke up at 9 am (when I should have already been at work) and realized that it was so loud that it had drowned out the sound of my alarm clock — for an hour and a half. Saturday, I showed up a friend’s house for a potluck (or pitch-in, as I grew up calling them in Indiana). I was puzzled when I arrived and no one was answering the door and the house seemed abnormally quiet. It was at that point that I realized that I was 24 hours early. I am so brain-drained lately that I just wrote the date down completely wrong on my calendar. I have been wanting to make you a Lemon Mousse for a while now, but was held back by one teeny tiny issue: raw egg whites. Yes, this recipe uses whipped egg whites, which never get cooked. I wasn’t sure the reception this would garner, so I procrastinated on making this recipe. My recent discovery of Davidson’s Safest Choice Eggs, however, completely cleared up this issue. These eggs are pasteurized in an all-natural water bath to destroy all bacteria and eliminate the risk of nasties like Salmonella, making them safe to eat straight from the shell. 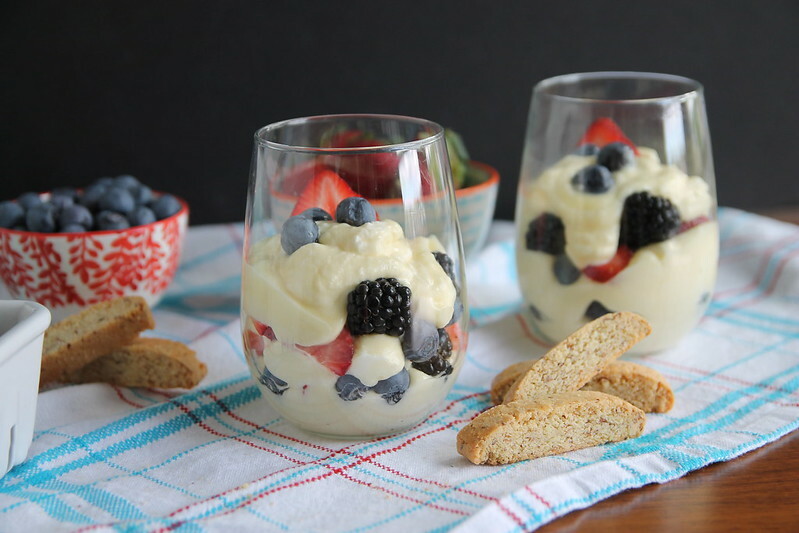 They also make glorious, perfect no-bake desserts such as this Lemon Mousse with Fresh Summer Berries not just a possibility, but your new favorite summertime dessert reality. The recipe below includes instructions for making your own ridiculously easy lemon curd (which takes only about 5 minutes of whisking over medium heat on the stovetop), but if you want to avoid all heat sources altogether, you may certainly substitute 1 cup of your favorite store-bought lemon curd. Just make sure to splurge on the good stuff here – this recipe uses very few ingredients, so we want to make sure they all shine. *Not true. Do not take nutrition advice from me. In a medium saucepan, whisk together whole eggs, egg yolks, sugar, salt, lemon juice and lemon zest. Cook over medium heat, whisking constantly, until thickened to a pudding-like consistency, about 5 minutes. Remove from heat and whisk in butter until melted. Using a fine mesh sieve, strain the curd into a bowl and refrigerate for several hours or overnight, until cool. Place homemade curd or 1 cup of pre-made lemon curd in a large bowl. In a large metal or glass bowl, beat the egg whites with an electric mixer until foamy. Add the sugar and continue beating on high speed until whites are glossy and hold stiff peaks. Using a spatula, gently fold ⅓ of the egg whites into the lemon curd. To fold, cut the spatula down the middle of the bowl, bringing it up along the bottom and edge and gently fold over the top. Turn the bowl 90 degrees and repeat until only a few streaks of egg whites remain. Repeat with half of the remaining whites, then the rest. In the same bowl that you whipped the egg whites, place the whipping cream and vanilla. Beat with the electric mixer on high speed until the cream holds stiff peaks. Fold into the curd mixture ¼ at a time, using the same method as for the egg whites. 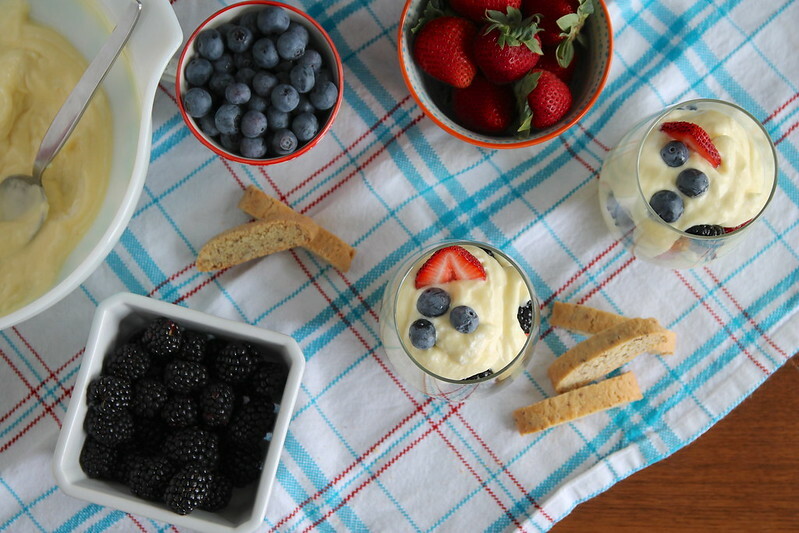 Serve chilled mousse layered with an assortment of fresh berries. This recipe uses raw egg whites - use only pasteurized eggs in this recipe for safety. 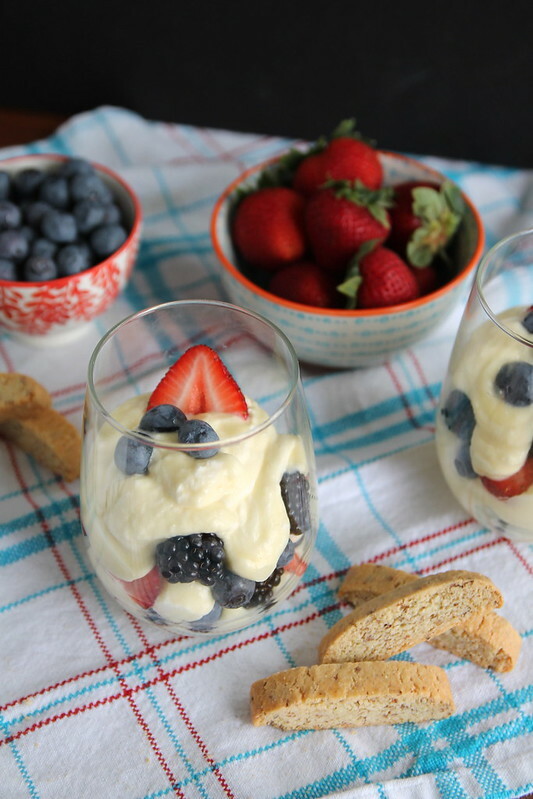 You may substitute 1 cup of pre-made lemon curd for the homemade curd in this recipe. From now until June 30, 2014, Davidson’s Safest Choice Eggs is running a #NoBakeSummer Pinterest contest – simply pin your favorite no-bake recipe and fill out the entry form on their Facebook page to be entered to win two prize packages each week! Follow Davidson’s Safest Choice Eggs on Facebook, Twitter and Pinterest and find a store near you that carries Safest Choice Eggs. Davidson’s Safest Choice Eggs compensated me for creation of this recipe and post. All opinions are, as always, 100% my own. Hello, Stephie – I found you via Erin at The Law Student’s Wife and was tempted to come and check you out because she described you as ‘hilarious’. That’s always a perfect sell for me! 😉 Anyway, really enjoyed this post. I’ve missed my alarm and woken up 2 hours later than I should a few times – I hate the ensuing frantic dash around the house trying to get ready and leave the house in 5 minutes flat, and it’s so embarrassing when you have to admit why you were late at work! Love the mousse. Perfectly simple for summer! Oh man, now the pressure is on! 😉 So glad you stopped by to join my embarrassing “I can’t hear my alarm clock” support group. Rumor has it that true healing comes in the form of approximately 18 servings of lemon mousse. Replace “heat” with “baby” and I am completely with you. At least that’s my excuse for wanting to make and eat no less than five of these yummy, fruity treats in one sitting. I hear mommy brain is a real thing. Is it possible to have mommy brain when you’re in no way a mommy yet? Because I think I have that. Oh my gosh Stephie, I’m laughing at and crying for you over here. Mooostly laughing though I’m not gonna lie 🙂 I can’t believe you slept through your alarm for an hour and a half. Those must have been some sweet dreams!! I’m loving this mousse and BRING ON THE EGG WHITES. for real i think this is one thing our society has just taken too far. something crazy like 1 in 20,000 eggs has the s-nasty, so really people, come on. live a little. Seriously, though, I slept better that night than I had in a long time. And, I’m not gonna lie, my coworkers and I had a good laugh about it when I finally got to work. Oh girl! That is redic! How high was that AC blasting? hahahha!!! But, even though you were late for work, you at least got a good blog post story out of the ordeal. I hate being late. It def puts you in a funk for the rest of the day. I can see the leftovers (if I have any) of these being turned into popsicles!!!! Mmmmm!!!! To be fair, the a/c sounds like a freight train no matter how cold it is running…And I definitely pondered doing a frozen mousse! Popsicles are brilliant! This looks so refreshing!!! I want it for dinner. Stopping by from the Weekend Social Link Party; these are gorgeous little mousse treats here, your photos are stunning! Thank you for sharing your wonderful blog post at #theWeekend Social! We enjoyed it! I look forward to seeing you next week at The McCallum’s Shamrock Patch Blog!